Bill spoke on the history of the Old Baldy Civil War Round Table. He has been gathering information and stories from older sources and has many pictures to display. 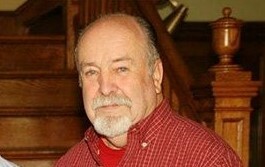 Bill attended Pfeiffer University and West Chester University. He has a Masters of Education and has taught and coached for 38 years. He spent 25 years as a volunteer fireman and six terms on school board. Bill first became interested in the Civil War about 1989 with visits to Harpers Ferry, Cedar Creek, Antietam, and Gettysburg. He belongs to the Civil War Trust and NRA. He is currently President of the Board of Directors for the Vineland Historical and Antiquarian Society. Bill joined Old Baldy in 1990 or 1991. He has published two books and written several articles for the Old Baldy newsletter. This entry was posted in Meeting archive on July 30, 2017 by hlj. This entry was posted in Meeting archive on July 15, 2017 by hlj.